Although practices of editing and mentoring are part of an author's daily activities, they have previously been largely neglected by the literary studies. The bilingual volume therefore assembles players from the fields of literary production and theories of authorship and the writing process, who discuss the development towards an opening up of the creative writing process. Their contributions encompass not only reports of experiences made by authors, editors, and mentors and insights into teaching methods applied in creative writing classes at higher education institutions in different European countries. They also explore theoretical approaches to an intersubjective literary practice as well as suggestions for the definition of a dialogic notion of literature in the age of online publishing. Die Bedeutung von Gesprächen in literarischen Schreibprozessen wurde bisher nur sehr wenig thematisiert. Autoren und Autorinnen verraten nur wenig oder ungern etwas über ihren Austausch mit anderen, LektorInnen und MentorInnen sind daran gewohnt, im Hintergrund zu arbeiten, und in den Literaturwissenschaften hat sich bisher niemand für die arbeitspraktische Dimension des Dialogs interessiert. The significance of conversations in literary writing processes has so far only been addressed to a very limited extent. Authors reveal little or nothing about their exchange with others. Editors and mentors are used to working in the background, and in literary studies no one has yet been interested in the practical dimension of dialogue. Das Buch wirft ein neues Licht auf literarische Arbeitsweisen: Schreiben wird nicht mehr nur als ein Selbstgespräch verstanden, das der Autor zurückgezogen und allenfalls in Anwesenheit imaginativer Gesprächspartner führt, sondern als ein dialogischer Prozess, in dem konkrete Rückmeldungen zum entstehenden Text eine wichtige Rolle spielen. The book sheds new light on literary working methods: Writing is no longer understood merely as a ›self-talk‹, in which the withdrawn author speaks to him or herself only, at best in the presence of imaginative interlocutors, but as a dialogical process in which concrete feedback on the resulting text plays an important role. Die Auseinandersetzung mit dialogischen Schreibprozessen ist für die aktuell verhandelte Debatte um ästhetische Praktiken interessant. Sie wirft zum Beispiel Fragen nach dem Verhältnis von literarischer Tätigkeit und der Inszenierung von Autorschaft auf oder aber nach dem Umgang mit und der Bewertung von künstlerischer Zusammenarbeit. The examination of dialogic writing processes is interesting for the current debate on aesthetic practices. For example, it raises questions about the relationship between literary activity and the staging of authorship, or about how artistic collaboration is handled and evaluated. Raymond Carver! Er hat einerseits unglaublich von der Zusammenarbeit mit seinem Lektor Gordon Lish profitiert und sich davon andererseits stark unter Druck gesetzt gefühlt. Von seinem Mentor John Gardner hat er gelernt, wie wichtig es ist, immer wieder mit anderen Augen auf den eigenen Text zu schauen und in der Auseinandersetzung mit Lish erfahren, was es bedeutet, wenn jemand anderes daran beteiligt ist. Raymond Carver! On the one hand, he profited incredibly from the collaboration with his editor Gordon Lish and, on the other hand, he felt under a lot of pressure because of it. He learned from his mentor John Gardner how important it is to look at one's own text with different eyes again and again, and to experience what it means when someone else is involved. Das Buch verhandelt die Dimension des Dialogs in literarischen Schreibprozessen. 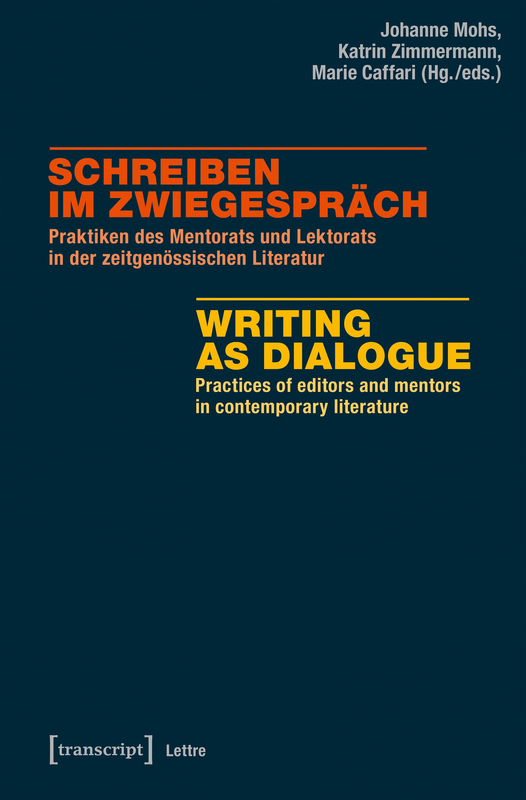 The book »Schreiben im Zwiegespräch/Writing as Dialogue« deals with the dimension of dialogue in literary writing processes.